Immigration and Customs Enforcement officials added a Honduran national wanted for vehicular homicide to their #MostWantedWednesday list. 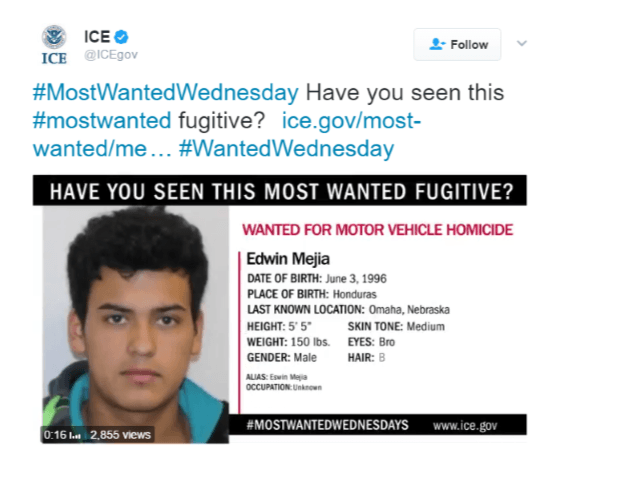 The at-large illegal immigrant, Edwin Mejia, was last seen in the sanctuary jurisdiction of Omaha, Douglas County, Nebraska. The agency tweeted “#MostWantedWednesday Have you seen this #mostwanted fugitive? Police arrested the 20-year-old Honduran national for felony driving under the influence and allegedly causing the death of 21-year-old Sarah Root. Omaha law enforcement officials say that Mejia was drunk and street racing on January 31, 2016, when he ran his truck into the back of her stopped SUV, reported 6 NBC News. Mejia’s blood alcohol level was reportedly .241, or four times the legal limit. The state had also suspended his driver’s license before the crash. He has a previous criminal history and had several warrants for traffic violations. He also failed to appear in court in 2015. Despite this criminal history and pre-disposition to not appear in court, and the fact that he was a flight risk because he was a foreign national/illegal alien, the judge in the case granted bail. As reported by Breitbart News, law enforcement officials reluctantly confirmed to the local ABC station that Mejia was “undocumented” and added that the department did not want the focus of the investigation to be on his illegal immigration status but on locating him. Both the Federation for American Immigration Reform (FAIR) and the Centers for Immigration Studies (CIS) list Douglas County as sanctuary jurisdictions. 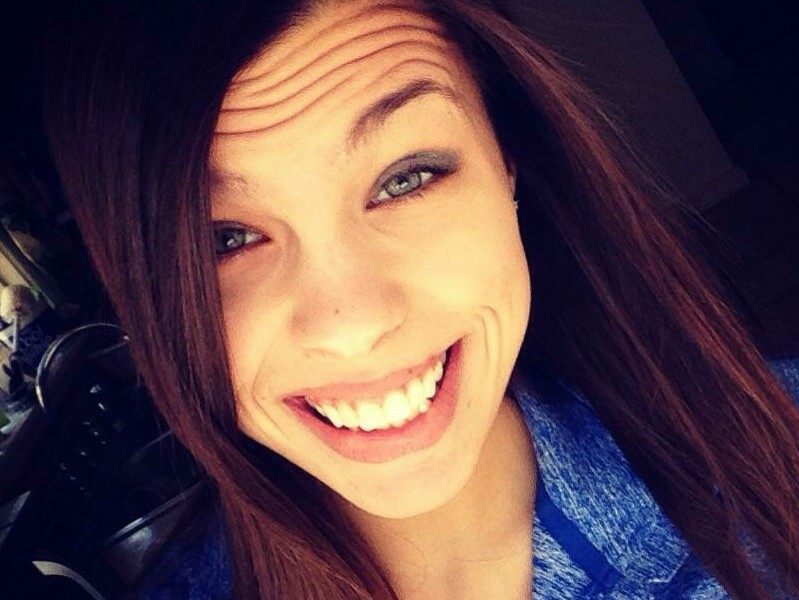 The impact caused the death of 21-year-old Sarah Root, a resident of Council Bluffs. She graduated from Bellevue University with a 4.0 GPA with a major in criminal investigations just one day before being killed in the crash. The case drew national attention and outrage after the details of Mejia’s release on bond became public. As reported by Breitbart News, the illegal alien is at large and may never serve prison time because ICE did not issue a detainer. Local police officials said they asked ICE officials to detain Mejia but ICE officials denied their request for an immigration detainer. Obama Administration officials said he did not meet their requirements for a hold. A judge set a $50,000 bond. Mejia’s brother paid the $5,000 bond fee, representing 10 percent of the total bond. The jail had no choice but to release the criminal alien after ICE refused to issue a detainer. At the time of his January 2016 arrest in Omaha on local criminal charges, Eswin Mejia, 19, of Honduras, did not meet ICE’s enforcement priorities, as stated by the Nov. 20, 2014 civil enforcement memo issued by Secretary Johnson, because he had no prior significant misdemeanor or felony conviction record. As such, ICE did not lodge a detainer. Mejia is scheduled to go before an immigration judge on March 23, 2017, and it will be up to the immigration courts under the Department of Justice’s Executive Office for Immigration Review (EOIR) to determine whether he has a legal basis to remain in the U.S.
Republican presidential candidate Donald Trump recognized Sarah Root’s family at an event in Des Moines, Iowa, in late August. A week after my daughter was killed, he is running free. … Sarah’s life cannot be just another life that was lost because of the Obama administration. 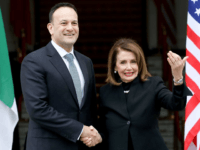 Like Mr. Trump said, they let us down. They had him, they let him go — they had him again, they let him go. “If Hillary gets in, it will continue to happen to everybody,” Michelle Root, the mother of Sarah Root added. The “Wanted” notice from ICE states that Edwin Mejia unlawfully entered the United States in 2013. Mejia was reported to have illegally entered as an unaccompanied teenager. Although there have been numerous attempts by the agency to locate the wanted man, officials have not been able to determine his whereabouts, and he remains un-apprehended. Edwin Mejia has one listed alias, “Edwin Mejia”, and his occupation is unknown. The agency lists Mejia’s date of birth as June 3, 1996. He is 5’5” and weighs approximately 155 pounds. View a list of ICE’s Most Wanted at this link on their website.